Technology is evolving at a fast pace and so is our lifestyle. And especially if you have kids then keeping an eye on them, monitoring them all day long, keeping a track of what they see on Television or Smartphone is one tedious task. Well, Google has a solution for this! What Is Google Family Link All About? Google Family Link is basically a Parental Control feature helps you monitor your kid’s phone usage. It allows you to assess how much time your kid is spending on their favorite apps with weekly or monthly reports. You can also set daily screen time limitations on their device. It also has a unique feature which allows to set bedtime of the device to ensure that kids have a proper night’s sleep and are straining their eyes playing games. Let’s see how to set up Google Family Link on your Kid’s Android Device. 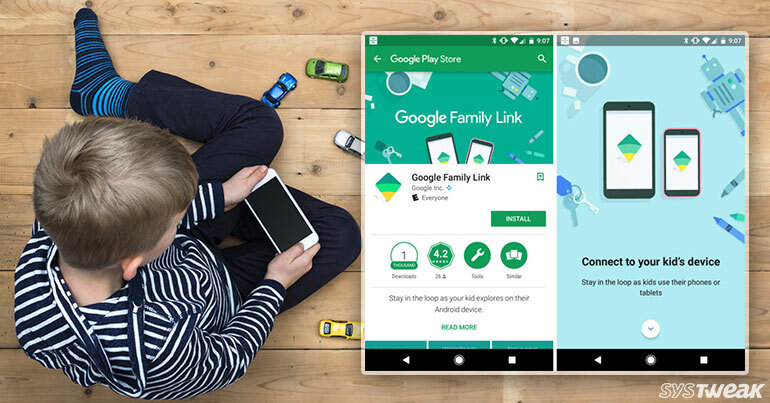 First, install the Google Family link app from the Play Store. Before you proceed further just make sure that your kid already has a separate Google account for their device. If not, then go ahead and create a new Google account with your kid’s credentials. Now launch the Google Family link app on your device and tap on “Get Started”. Swipe through the setup steps “See what you need” as per screen instructions. Before moving ahead, just make sure your kid’s Android device is compatible with the app and running on Android version 7.0 and above. Now, you have to create a separate kids account and link it to your Google account. Fill up the details and tap on “Next”. To verify if you are a parent, Google will now request your consent and charge a small fee of 0.30$ from your credit card. Check on the “I agree to let Google create a Google account for my kid” and tap on Agree. That’s it! Now switch over to your toddler’s phone and sign in to their Google account. Before Google logs in to account, you’ll be asked to grant various parental permissions. Once logged in, you’ll be prompted to install the Family Link app on the child’s phone. Now you get an access to control the apps which your kids see on their device. Once you’re done choosing tap on Next. Congratulations! You’ve successfully set up Parental Controls on your kid’s Android phone. Both the devices are now connected. Once both the devices are connected and Family Link has been created, the next step involves reviewing and monitoring activities. Settings: Tap on “Manage Settings” from the top menu bar and explore various options. App Activity: On the home screen of the app you’ll also see one “App Activity” section. It allows you to keep an eye on your little guy or gal is doing on a daily, weekly, and monthly basis. Screen Time: Here you can set daily time limits of your kid’s phone. P.S. The best part about Google Family Link App is the fact that your kid won’t be able to see the app on their device and tweak the settings. Family Link is a great solution for parents to keep track and monitor your kid’s activities on phone. Do let us know what you think about this!